Win a case of TOLERANT Red Lentil Pasta! If you love pasta but the gluten in traditional durum wheat-based pastas don’t agree with you, be sure to read on about our TOLERANT’s pasta giveaway worth $42.00. TOLERANT is a legume-based, certified organic, gluten-free, non-GMO, vegan product in the shape of pasta. In a 3oz serving, it provides more than 20 grams of protein—about the same as a 3 oz. serving of chicken! That’s about 400% more protein per equal serving than any other competing pasta products. But unlike animal-based sources of protein, this pasta is also high in fiber, provides a full veggie serving and it’s low-GI carbs will provide long-lasting energy. The combination of protein and fiber will keep you fuller longer, so you’ll be less likely to overeat. It comes in Red Lentil, Green Lentil and Black Bean flavors, as well as kid-friendly shells and elbow shapes. You can make all of your favorite pasta dishes using TOLERANT pasta varieties. It’s currently distributed in more than 1,000 retailers throughout the United States, including shelf placement in Kroger, Shaws, Target, Sam’s Club, Costco, Whole Foods and hundreds of independent health food stores. Quick Cook Time – ready in less than 10 minutes. Like AFH on Facebookand be sure to sign up for our no-spam-ever e-newsletter which goes out once per week. 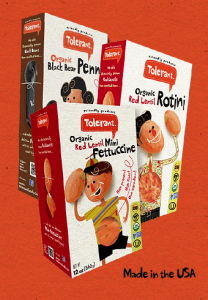 Leave a comment below telling us why you’d like to win the TOLERANT pasta giveaway. Comments will be accepted through June 1, 2015. This pasta is delish and a wonderful vegetarian option for tons of protein. Thanks for all you do! My girls love tolerant pasta! A case would be amazing! We love tolerant pastas. So thankful to have a product I can eat without aggravating my food allergies . I love pasta and love lentils, but I never cook with them. Would love for this to be a “gateway” food for introducing lentils to my kids. I love this pasta and have just been raving about it to family and friends! My family loves pasta and we eat it every week for dinner. We’ve never had a red lentil pasta and it sounds very intriguing and definitely nutritious as well. Facebook fan and newsletter member too. This pasta would be tasty, healthy, and our family would enjoy eating this amazing red lentil pasta. Thanks. Sounds like a great new idea for pasta. I’m familiar with quinoa pasta, but not this lentil type. Big fan of lentils, and beans. I would love to try this because we are big pasta eaters and this sounds so much healthier than other pastas out there and I love trying new foods! I love your pasta. I bought a box of it last week. 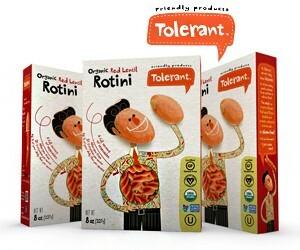 I love Tolerant red lentil pasta and would love to try the other kinds. I haven’t been able to find them in my city. I would love to win this to make my gf life easier! I love new, creative ways to sneak good stuff into my family’s meals. What a healthy and wonderful pasta. Sounds so appealing and delectable. As a vegetarian, I think this would be a great source of plant based protein. I love pasta and really like the fact that this is so high in protein and fiber. I won’t even need a protein shake after a workout. It sounds much healthier than regular pasta. Our home loves both pasta and lentils so a combo of the two together in a product sounds fabulous! We’d love to give them a try and so healthy too! Thank you for the giveaway. I am really like that they have more than 20 grams of protein. I don’t eat a lot of meat so I am always looking for a way to get more protein into my diet. I want to win because I haven’t had these before. I think it’s great that they come in Red Lentil, Green Lentil and Black Bean flavors. It sounds good! These sound like great item for my whole family. I would love to be able to sneak some more veggies into my kids diet. Sounds like a great new gluten-free option to try out! I discovered your lentil pastas several months ago and have been recommending them to everyone, including asking my local store, The Boys Farmers Market in Delray Beach, Florida, to please stock them. Your pastas are the best bean-pastas I have ever tasted. They have the taste and texture of wheat pastas, and come in fun shapes, like ziti. I love that they are made of nothing but lentils or beans. Best-selling author Joel Fuhrman, M.D., who touts a “nutritarian” plant-based diet on PBS and the Dr. Oz show, says we should be eating beans or lentils every day for good health. Tolerant pastas are an awesome way to get beans and lentils into our diet! Thank you so much for creating this line of products! Toss w/fresh organic farmers market English peas. Roasted garlic olive oil & your fav grated cheese. We like Asiago or Romano Pecorino!